Do you know how valuable eye exams can be for every member of your family? Making eye exams a priority is important for children and adults. Parrelli Optical provides friendly eye exams in Middleton, MA and the surrounding areas. Eye exams are essential for everyone, and people who already wear glasses or contacts are encouraged to have an exam done at least once per year. The shape and condition of the eye is changing constantly. Prescriptions must be adjusted on a regular basis in order to ensure that a person is able to achieve the vision correction that they need to enjoy life to its fullest. People who do not wear glasses or contacts may think that it is acceptable to forgo eye exams, but there are problems related to the eye that could be developing behind the scenes. Regular exams could mean that these problems will be detected and corrected or treated earlier. Glaucoma, cataracts and macular degeneration can all affect a person’s ability to see. Glaucoma is caused by pressure in the eye. This condition can lead to blindness, and the pressure that causes glaucoma is not detectable outside of an eye exam. A diagnosis must be made so treatment can be started to save a person’s vision. Cataracts impede vision and must be corrected through surgery. Macular degeneration is a condition that is associated with aging. This condition can be treated if detected early. High blood pressure and diabetes can also be detected through an eye exam. 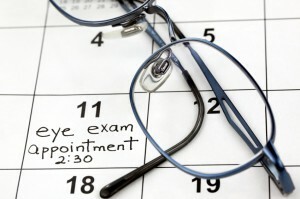 Eye exams are the key to maintaining good vision for years to come. When you need eye exams in or around Middleton, MA, contact Parrelli Optical.